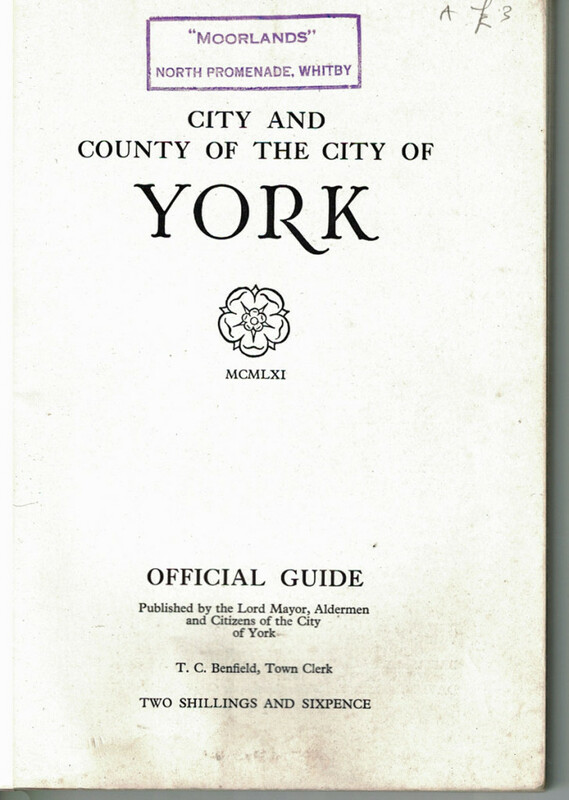 Front cover of the official guide: City and County of the City of York (1961). Illustration by Kenneth Steel. I’ve wanted to mention this particular guidebook, and feature a few scans of its pages, for some time. Much of it is the familiar tourist-focused information on the Minster and other famous buildings. But alongside that are many pages illustrating York as it was for people living in the city, the places where residents worked and shopped. My particular copy was once the property of Moorlands Hotel in Whitby, the stamp in the front suggests. I wonder how and when it ended up tucked away in a corner of a secondhand bookshop in York. 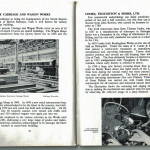 The booklet was published ‘by the Lord Mayor, Aldermen and Citizens of the City of York’. For me, looking at this title page of the booklet, the inclusion of the ‘Citizens’ — and the fact that the word is capitalised — really stands out. Do we use the word ‘citizens’ as often now? Probably not, and perhaps not with this amount of civic pride. It’s perhaps even more likely to provoke memories now it’s 57 years old, and it certainly gives an insight into the city as it was at the start of the 1960s. 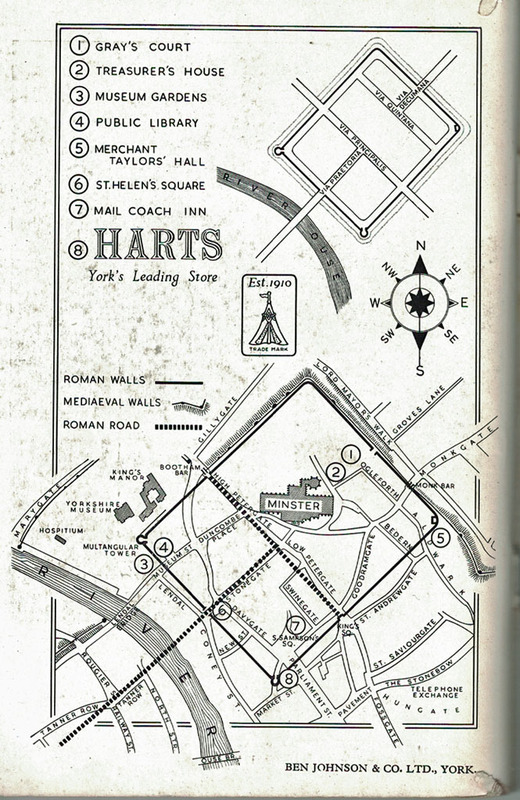 After many pages of the kind of information you’d expect to find in a guide for visitors — the history of the city, and its well-known historic buildings — the subject of page 69 is the University of York, not built at that point, but clearly seen as an exciting and important thing for the city, after government approval in 1960. Ah yes, the wagons de chemin de fer, the chocolat and the instruments optiques. It sounds even more impressive in French. 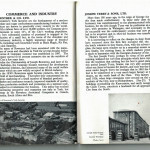 The advertisements towards the back of the guide remind us too of other places where many York citizens worked, back then. Examples of Adams Hydraulics ironwork can of course be seen all over York, if you’re paying attention to ground level ironwork (and perhaps in particular, as a 21st century citizen, if you’ve had concerns about silted-up street drains). Hunter and Smallpage’s advert inside the back cover of the guidebook highlights that the shop had ‘6 floor showrooms’ and its own private car park, which must have been where Café Luca is now. 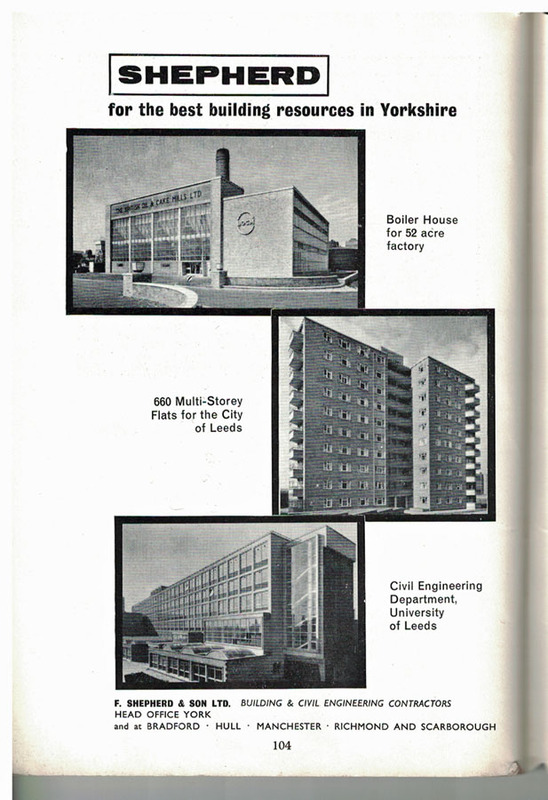 Interesting that the map includes mention of the telephone exchange, which of course at that time would have been a fairly new building, and was clearly seen as a landmark worthy of mention. 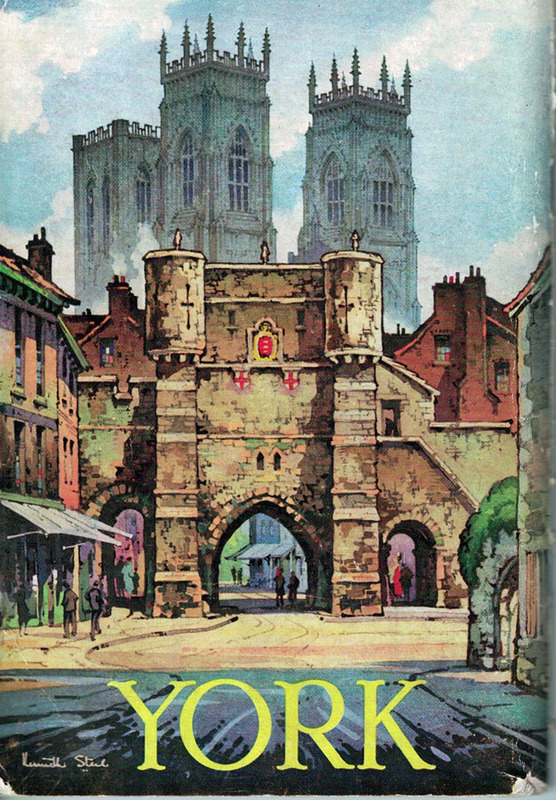 And in the bottom corner of this page, the last page of the guide, mention of the printer of this official guide to York, in 1961. 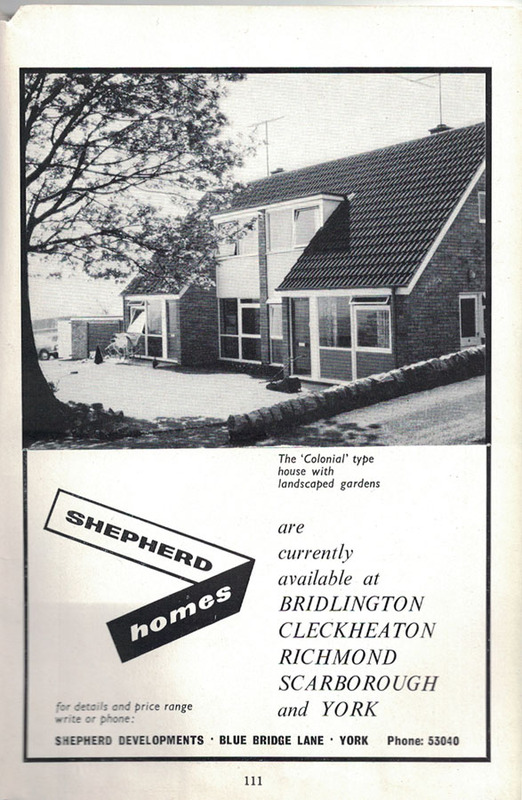 Printed locally, of course, at Ben Johnson’s, as so many things were, back then. When I first thought about including this 1961 guide I thought it would be a case of just scanning some of the pages and adding them without too much comment, perhaps no comment at all. But it always ends up being more complicated than that, and several hours on from when I started this ‘quick page’ I find I’ve still not finished, as looking carefully always prompts more questions, and usually more Googling. 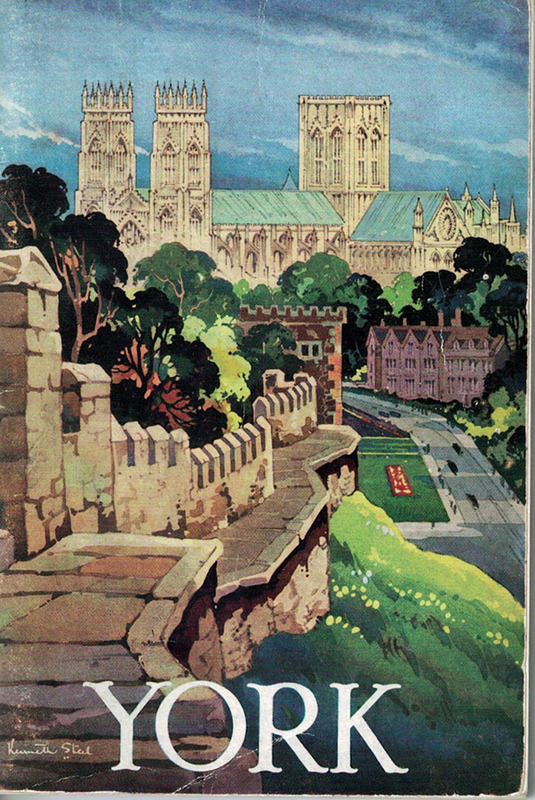 So I just have to mention the cover illustrations of this lovely guidebook, and the fact that when scanning it I paid more attention to the signature, Kenneth Steel, apparently. The back cover illustration is particularly pleasing. 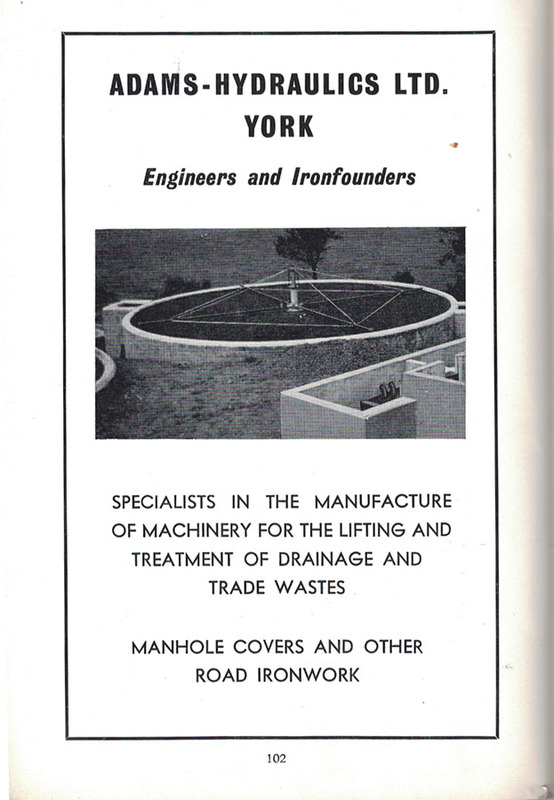 1961 York guide, back cover. Illustration by Kenneth Steel. Harts was, if I remember correctly, where the Disney store is now. 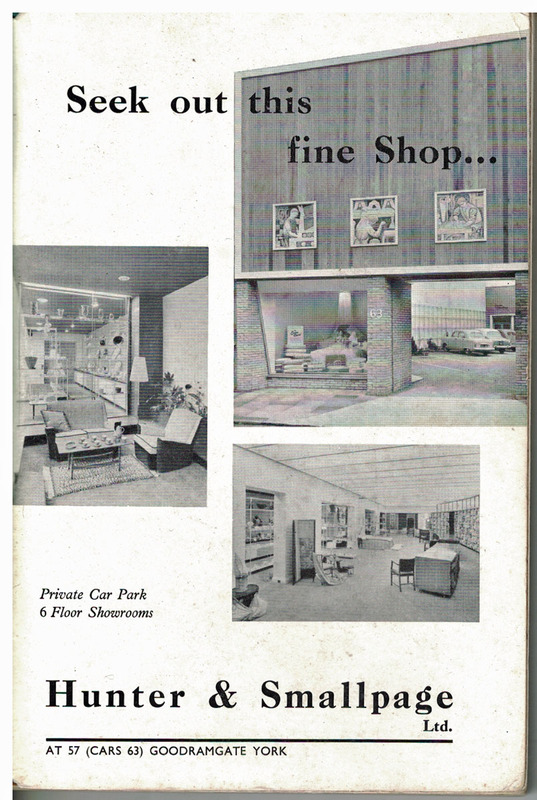 It was a good furniture shop and I inherited the 3 piece suite that Mum and Dad bought from there in 1961!